Crowd listens to stories about sheepherding at the 15th Old Sheepherders Gathering held Jan. 19-20 at the Border Inn on the Utah-Nevada border. 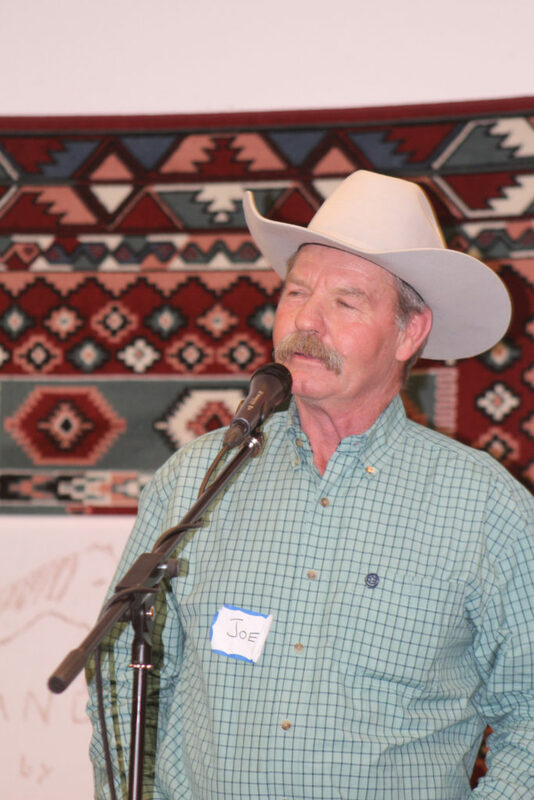 BAKER, Nev.—Hank Vogler, who runs a sheep ranch in Spring Valley, one of the valleys in the complex of lonely valleys between Delta and the Sierra Nevada Mountains, kicked off a storytelling session at this year’s Old Sheepherder’s Gathering by reciting a cowboy poem. I’ve had every ache and ill.
Where I spent a year alone. That elicited a chuckle from people who had come in from frigid sheep camps in the west desert of Utah and beyond to share some of the lore and culture of sheep ranching. Mary Kay Knaphus, a country singer-songwriter and former Manti resident, was one of the entertainers at the event. The annual gathering, held this year on the weekend of Jan. 19-20, occurs at the Border Inn, a combination gas station, convenience store, casino, restaurant and motel located on U.S. 50, the proverbial “loneliest road in America.” The Border Inn is smack dab on the Utah-Nevada border. The inn, situated about 40 miles west of Delta and 10 miles east of the tiny ranching town of Baker, Nev., is a kind of oasis of civilization in the vast stretches of sagebrush that define the west desert. The Old Sheepherder’s Gathering started 15 years ago when Denys (pronounced Denise) Koyle, the proprietor of the Border Inn, invited some sheepherders to a free dinner one night in the depths of January. “One of the sheepherders gathered names and addresses, the next year we mailed out invitations and it built from there,” she said. This year, about 150 people registered for at least one session of the gathering. 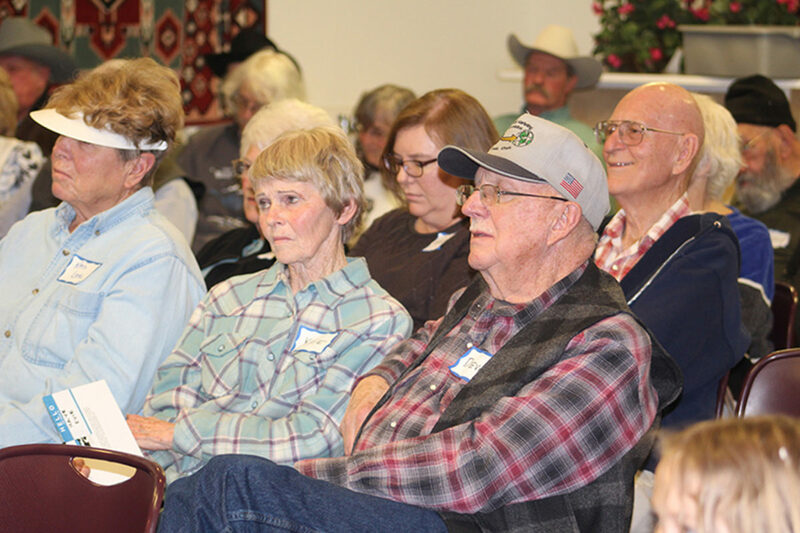 Based on observation of the attendees, one-third to one-half of them were from Sanpete County or had ties to the local sheep industry. Before the storytelling session got rolling, Koyle offered a tribute to Keith Keisel of Ephraim, founder of Seven States Recycling, the son of a sheepshearer and a perennial guest at the Old Sheepherder’s Gathering. Even when the gathering wasn’t in session, Keisel liked to drive out to the west desert and hang out at the Border Inn. Keisel’s death a month earlier “left a big hole here,” Koyle said. Then she told a story about one of Keisel’s last visits to the Border Inn. While there, Keisel started having trouble with his pickup. It wouldn’t start. Then one day, she noticed a section had been cut out of her garden hose. Keisel had used the garden hose to replace a hose in his vehicle. “He roared out of the yard,” Koyle said. She asked him what he was doing. “I’m going to Ephraim,” he replied. One of the first people with Sanpete County ties to get up and tell a story at the gathering was Joe Nicholls, who came all the way from Monterey, Calif. He is originally from Manti. In 1955 at age 12, he started helping his father, Clair Nicholls, herd sheep through the summer on the mountains west of Manti. When it was time for a break from riding and camping out, his dad would set a cedar tree on the mountain on fire, John Nicholls said. His mother would follow the smoke to her son’s location. The mention of Clair Nicholls brought Joe Frischknecht of Mayfield to the storytelling microphone. His father, the late Kay Frischknecht of Manti, had a big sheep operation. But unlike a lot of other sheep men, he always kept his sheep within 33 miles of his ranch. Joe’s father believed in walking. “Everywhere we went, we walked,” his son said. Finally, Joe saved enough money to buy a horse from Clair Nicholls. But Joe didn’t get a good deal. “I traded horses back and forth a dozen times trying to get even, and I never did,” Joe told the gathering. When it came to ranch work, Kay Frischknecht was unyielding. His son Joe recalled a time when he was a teenager and a chute being used to load sheep onto a truck fell on him. Another Sanpete County resident who took the microphone was Scott Larson, 76, of Manti. When he was 10 years old, he said, he spent the summer camping out with sheepherders in the mountains west of Manti. One summer, the late Gary Madsen, owner of another big Manti sheep operation, lost his herder when the herder was thrown in jail. So Madsen asked Larson, who was still in high school, to take over. Larson made $125 per month, which was “big money” at the time. 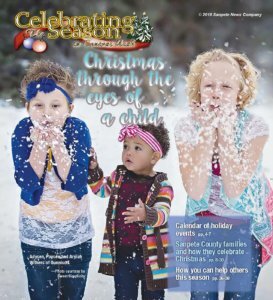 As a teenager, Larson spent nearly every Christmas vacation in the west desert herding sheep for one of the Manti sheep ranchers to give the regular sheepherder a break. Larson didn’t go into sheep ranching himself. He spent his career in road construction. He’s retired now, lives in the same house he grew up in and has been married to his wife, Susie, for 54 years. 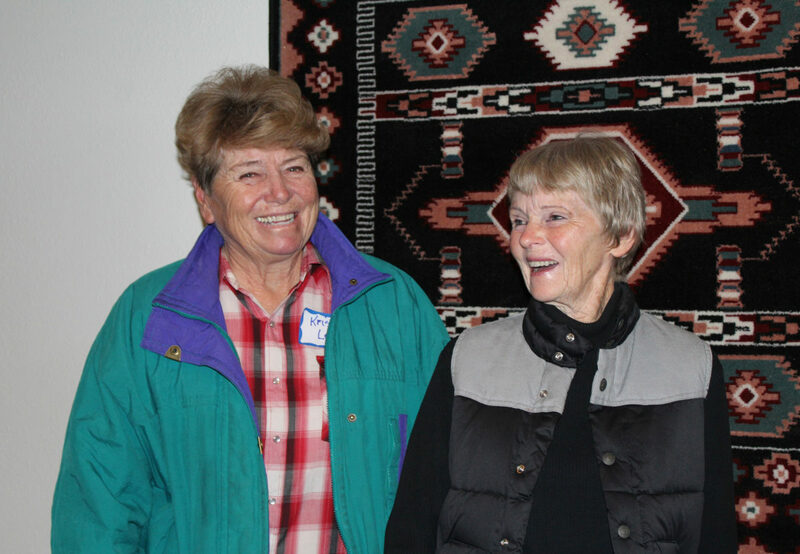 Two of the attendees at the sheepherder’s gathering were cousins—Lois Nielson Sheets, who grew up in Fountain Green and now lives in Hurricane, and Linda Madsen Cowart, who grew up in Mt. Pleasant and now lives in West Valley City. Both their fathers were sheep men. Sheets is the daughter of the late Pharis L. Nielson and Elna Madsen. She is a great-great-granddaughter of Andrew Aagard, one of the founders of what became the once lucrative Fountain Green sheep industry. Cowart is the daughter of the late Royal Madsen. Royal Madsen and Elna Madsen were brother and sister. Sheets took the microphone to tell a fun little story. Once her father arrived at his sheep camp on the west desert to find the faces of his sheepherders covered in red. The sheepherders had used lipstick to protect their faces from the biting wind. 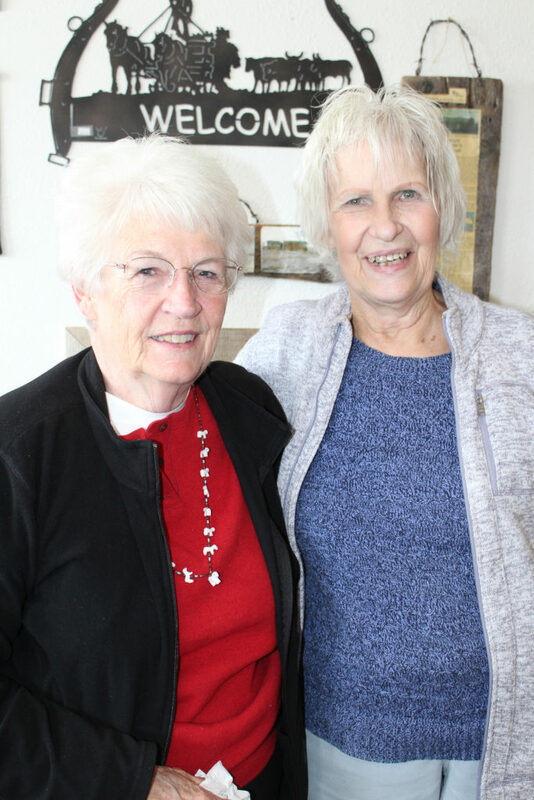 Two other women with Sanpete County roots were sisters Kaye Ivie of Payson and Kristine Lee of West Mountain in Utah County. They are the daughters of the late Newell Johnson and Joy Aagard, both of whom grew up in Fountain Green. Newell Johnson moved his family to Provo but continued sheep ranching all his life. He served a term as president of the Utah Wool Growers Association. He died in 2006 at age 99. His daughters read from a family history about the winter of 1948-1949, one of the harshest ever in the west desert. Newell Johnson was grazing 3,500 sheep there at the time. On his way to his sheep camp in a blizzard, Johnson’s pickup and two other trucks from Sanpete County came to a stop because the road was no longer visible. Five men crowded into the small cab of Johnson’s truck, which still had heat, and waited hours for help. That winter, the U.S. Army dropped hay from planes to starving sheep below. But good intentions turned to tragedy when one of the bales fell on a sheepherder and killed him. Ivie is a testament to the notion that sheep run in people’s blood. Although she lives in Payson, she still has her own herd of 500 sheep. She still winters them on the west desert and still uses family property between Fountain Green and Moroni for lambing. 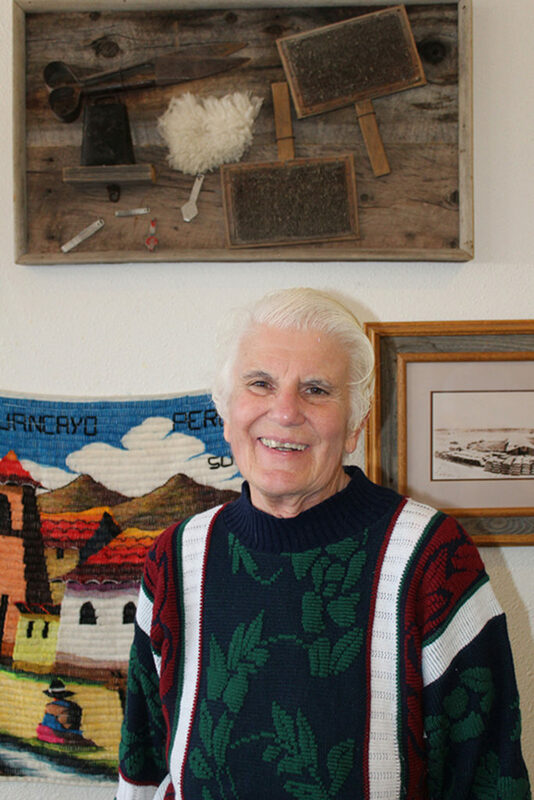 In recent years, Koyle has arranged to have photos taken, oral histories gathered and sheepherder storytelling sessions videotaped for inclusion in a Great Basin Archive at the Marriott Library at University of Utah, where she went to college. At this year’s gathering, she made an emotional announcement. She is past age 70 and is retiring from running the Border Inn. For now, her son is taking charge. She plans to move back to Salt Lake City. “I’ll be able to go up to the library and feel at home,” she said. Kaye Ivie and Kristine Lee are daughters of the late Newell Johnson and Joy Aagard. Both of their parents grew up in Fountain Green. After they started their family, the Johnsons moved to Provo. Nonetheless, Newell Johnson spent his whole career in the sheep business. Ivie still has a sheep herd and still does her lambing on family property between Fountain Green and Moroni. Cousins Lois Nielsen Sheets, who grew up in Fountain Green, and Linda Madsen Cowart, who grew up in Mt. Pleasant, are regulars at sheepherder gatherings. Both of their fathers were sheep ranchers. Joe Frischknecht, a sheep man who lives in Mayfield, tells a story at the sheepherder gathering. Denys Koyle, who has been proprietor of the Border Inn for more than 30 years, is the founder of the Old Sheepherders Gathering. She is standing in front of a wall hanging at the inn containing a spot of wool, carding tools and other implements of the sheep business.